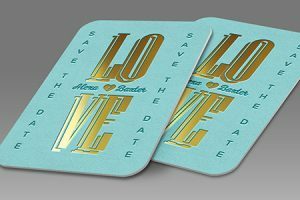 Foil printing Bournemouth, also known as hot foil stamping, is normal carried out with a hot stamping machine using a uniquely made heated die and gold or silver foil. RP Printers offers traditional hot-foiling including new and innovative ways to execute nearly any foil job. We offer a massive selection of colors, applications and finishing options at prices that can work for almost any job. Depending on your desired result, foil printing can be applied to nearly any surface or substrate. While some local print shops may claim to offer foiling services, many of them outsource the job to an outside facility. At RP Printers, we lay home to all the lastest foiling equipment and technology to achieve optimal efficiency, while delivering an excellent final product at a competitive price! If you need us to carry out Foil printing Bournemouth for your business, call us now on call 01202 557917 to discuss your options.